It is recognized by scientists around the world that smaller particles of zeolite are much more effective at reducing toxins and heavy metals than large particles of zeolite because of the effectively larger surface area provided by the smaller particles. In fact, the benefits provided by small-particle zeolite can exceed those of large-particle zeolite by hundreds and sometimes thousands of times. Hence, the smaller the zeolite particles are, the more effective the product. Similar to a map scale, the scale on the left margin of the SEM micrograph pictures below (y-axis) indicates a relative dimension of 10 microns in length. As can be seen in the high resolution particle picture below, a significant quantity of the Brand X zeolite product has particles as large as several microns; with some particles in excess of 5 microns in diameter. The small inset micrograph located in the upper right of the picture below shows the exact relative sizes of Results RNA? 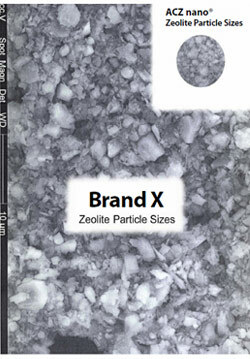 zeolite particles compared to the much larger average particle sizes of the Brand X product. Particle sizes for Results RNA? zeolite product extend well down into the nanometer size ranges.